Is blackjack the answer to Montana’s revenue woes? HELENA – Rep. Wylie Galt, R-Martinsdale, says generating revenue for the state can be as simple as counting to 21, meaning, playing blackjack. House Bill 578 would legalize the card game, for both tabletop and video play. The bill also allocates a $500 tax on each blackjack table to the state’s Department of Justice and a state special revenue account — $100 going to the DOJ, and $400 to the account. After the first year, the bill divvies up money in that special revenue account, giving 42 percent to Health and Human Services, 28 percent to the Office of Public Instruction, 14 percent to the sheriff’s retirement system and 14 percent to the Office of the Commissioner of Higher Education. This money is to be used on programs such as vocational, suicide prevention and gambling addiction. There were no supporters at the House Taxation Committee’s first hearing of testimony on the bill Wednesday. Angela Nunn, Administrator for the Department of Justice’s Gambling Control Division, opposed the bill and said if it were enacted, the estimated revenue would not be sufficient to regulate the activity. “That means that the gambling state special revenue fund or some other funding source that they come up with would have to make up the difference in order for us to adequately perform our statutorily obligated duties,” Nunn said. She said the department would need additional employees in order to be able to monitor and handle disputes in the state. Nunn added that facilities with blackjack tables would also incur more overhead costs to monitor the tables. “The amount of effort needed to regulate this correctly makes it, from a practical sense, very difficult to implement by October 1 of 2018,” Nunn said. Jim Johnson, president of the Montana Tavern Association, also opposed the bill. Johnson is a liquor license holder and said he is not interested in having blackjack tables in his bar. “We had a meeting yesterday with our local Carbon Stillwater Tavern Association of nine bar owners, none of whom are interested in having blackjack in their establishment,” Johnson said. 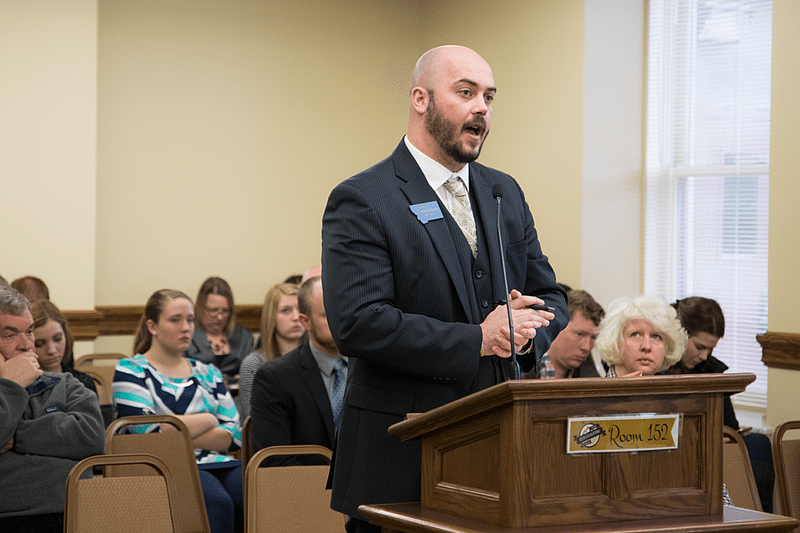 Speaker Austin Knudsen, R-Culbertson, is co-sponsoring the bill and released a statement via email after the hearing. “This is a Montana-made solution, giving establishments and individuals the option of Blackjack to poker games they already play, and will help our state fill needed gaps in revenue,” Knudsen wrote in the statement.